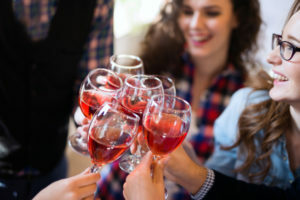 Wine tasting events are a fun and inexpensive way for wine newbies to learn what they like and what they don’t like. If you are confused about how to conduct yourself at a wine tasting event, here are a few do’s and don’ts to get you off on the right foot. Don’t Wear Perfume or Cologne. Heavy fragrances can interfere with the subtle aromas of the wine and ruin the tasting experience of others. Leave the Flowerbomb and Polo Sport at home. Do Eat Before You Go. You will be tasting a lot of wine and all those little sips add up. A full stomach will help you to ward off getting drunk so that you can spend more time at the event. Be Open Minded. Don’t go into a wine tasting event with the notion that you will only drink a certain type of wine. Try everything. If you like a particular wine, try the same wine but from a different country. Don’t be afraid to try new things. If you don’t like it, you can always spit it out. Don’t be a Know-It-All. Watching Sideways does not make you a wine connoisseur. Go to the event not just to drink, but also to learn about different wines, the regions they come from and types of grapes used to make them. Look at the clarity and color. Swirl the wine and have a quick sniff. Smell the wine to take in the aroma. Sip the wine and let it roll around your mouth. Do Know When to Spit and When to Swallow. There is much debate on spitting versus swallowing when wine tasting. If you do not like the wine or you are the designated driver it is ok to spit. Similarly, if you plan on tasting a lot of different wines, spitting will help you to pace yourself. If you do spit, make sure you spit into a bucket, spittoon or napkin. Do not spit back into your cup or on the floor. Spit with a bit of force so that you don’t dribble down your chin or shirt. Don’t Ask for “The Good Stuff.” Asking for “the good stuff” makes you seem like an uncivilized lush. However, if there is a particular unadvertised wine you have been eager to taste, it is acceptable to inquire if it is available in a pleasant and courteous manner. If your request is granted, be sure to thank the server and consider purchasing the bottle. Don’t Haggle. If you want to purchase wine, do not haggle over the price like you are buying a used car. As you begin to collect wine, you need to think about where you will store your collection. When the time comes to look into off-site storage, check out STORExpress! Our wine storage units can accommodate up to 400 bottles.